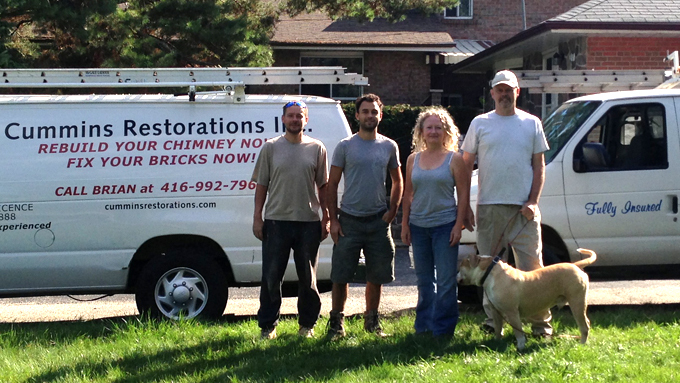 We are a family-owned and operated business working all over the Greater Toronto Area since 1992. We are fully licensed and insured. Our goal is to ensure you are fully satisfied with your masonry restoration project. Whether it’s your chimney that needs rebuilding or repair, a brick wall that needs brick replacement, tuckpointing (filling in mortar between the bricks where it has eroded), or brick cleaning to enhance the appearance or parging (re-veneering a surface with cement). I came to Canada when I was nineteen years old in 1985. I worked for different restoration companies and I decided to open my own business in 1991. I have been doing brick work on peoples homes all over the GTA since then. I am fully licensed and insured. I work with my son and all the paper work is handled by my wife. I can keep costs down for my clients because I sell and deliver the work myself with my son. There’s no middle man adding his commission costs to the price. I will always answer any questions people may have before, during and after the work is done. I believe in straight answers to every question a client may have. I have superior communication skills so my clients are never left wondering if they have been understood or not as to what exactly they want to get done in the way that they want it done. Some of my clients include the late Ted Rogers on whose house I worked, Starbucks, Bank of Nova Scotia, CIBC Bank, and countless homes and businesses across the GTA.